We are in a war! But this conflict not the war that you think. It is not the familiar culture war over abortion rights, gay rights, evolution/creation and whether or not granny can pack some heat to the Sunday morning church meeting. This war is insidious in that people who are supposed to be “on the same side” are actually doing the work of the enemy. This war is corrupting the Gospel, stripping away the power it holds and reducing it to an impotant civil religion. The war we are fighting is against the invasion of politics into out faith, and the deceptive nature of politics in wooing Christians into the political arena with promises of defeating the enemies of our moral/social values. So we jump onboard rallying behind men and women who shake our hands, pat us on the back, placate us with trinkets of public moral outrage, yet inwardly laugh at our ignorance and stupidity. And our “Commanders” continue to urge us forward to join them in supporting politicians who “think” like us. People like Rod Parsley, Pat Robertson, Jay Sekulow, John Hagee et al write books and fill the christian airwaves with battle cries to stand up and be a Christian, save America and bring us back to our Christian roots. They are also purveyors of fear because fear motives. Comments such as “our rights are being taken away, our children are being seduced, our freedoms are being stripped away by the evil, liberal, socialist, progressive democrats”, are heard in a variety of forms. And the support and the money for these “ministries” keeps rolling in. 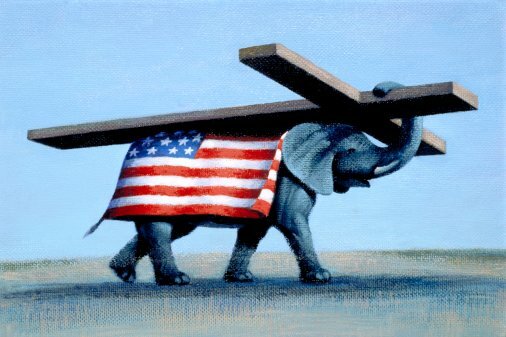 Evangelical Christianity has now been successfully fused to the Republican party. The message we have to offer to the world is all but buried under mountains of political rhetoric. Who appointed any of these guys to be our leaders? They don’t speak for me, they only have their own agendas. true that, mark. jesus weeps mad tears for all this BS. God’s people never learn. In the old testament, Israel demands a king to be like the other nations. And when Israel is split in two, the Northern Kingdom uses cows/bulls to be symbols in their holy sites–which was the blending of the Hebrew faith and Ba’al worship. We choose to symbolize our “set apart-ness” through shallow means like the music we listen to or the clothing we wear. But what does God require? Love mercy, do justly, and walk humbly with the Lord. Mercy is not the way of America. In America, you do justly as long as it is profitable. And walking humbly as an American–nope, we have to have the biggest, be the loudest, and most of all, never show any sign of doubt or forgiveness. Oh, to fall in love with God again. Great, great post Leanne. Thank you. Render to the man and move on…. Sometimes that is easier to say than to do…..I have seen the Gospel message corrupted by many these days and I was trapped in that for a long time myself. You have a great blog by the way, I enjoyed it!